Alyssa Gardner is most definitely not the person she was yesterday. She survived a rather harrowing escapade in Wonderland, finding herself Queen of this mysterious and tripped out lnd, but all she really wants to be is normal. Human. Anything but the half-netherling who still talks to bugs and creates terrifying mosaics made from blood. Overall, and excellent series continuation. The characters are original, the story is complex, and the pacing keeps you firmly entrenched in the book. I will justify my "not so awesome" responses with the fact that we are dealing with exceptionally angsty teens in the teen room at my library, and I'm exhausted. And it's to be understood. Alyssa is battling who she is versus who she wants to be...trying to plan an entire future as a young teenage girl. It's hard! Despite the angsty-ness, I love Alyssa and her wacky style. I love Morpheus and his seductive personality. And I love Jeb for his loyalty. So I will wait (not-so-patiently :) for the next installment! 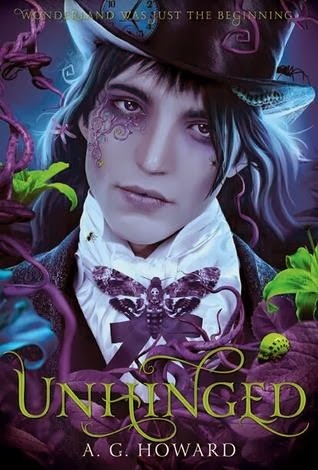 If you're a fan of Alice in Wonderland, classic re-tellings, and well-written contemporary fantasy novels, check out Unhinged by A.G. Howard.